I painted this army for small demo games, and imagined them as a boatload of sneaky raiders, who only attack at night. Hence their army colours are black, dark silver, and deep red. But one way to make lots of black look more interesting is to paint various bits in gloss black and others in dull matt black. So I gloss varnished the armour plates, to give the impression of black laquer. The skin tones I used are extremely pale, almost white, and so to reinforce this I added patches of crisp white snow to all the bases. The stark white and midnight blacks work great together. This is the leader of the Black Talon, Dark Elf Sorceress Morlanna, who has raided the coastal towns for the past 40 years. A very stylish model, which I made a little hotter by carefully filing away her underwear! 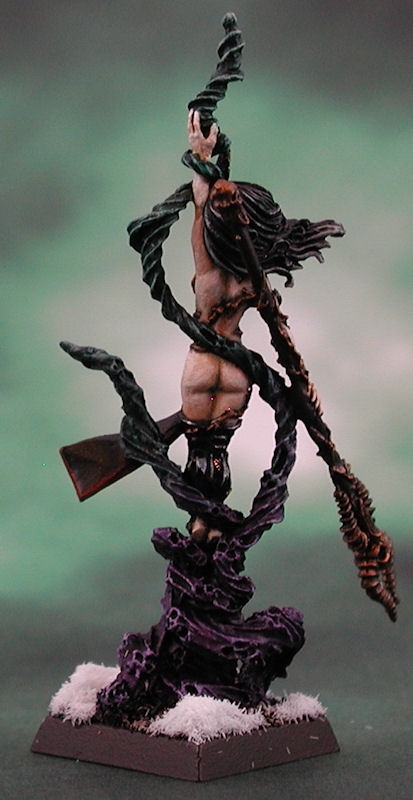 The brazen brass staff is an echo of the normal black laquer armour of the rest of the dark elves, which are edge lined in the same colour. I also gloss-varnished her leggings, to give her shiny black leather appeal. The deep parts of all the skin on these elves (between the fingers, around the eyes etc) were carefully darkened with asurmen blue wash, which gave them a cold and frosty look - both physically and characteristically. Is that a word? The model is actually a high elf mage from the Reaper range of models, adorned with a dark elf helmet spike and a new sword. I gave her pale blond hair, to fit her backstory a little better. She also has richer red lips, eyeshadow and nails, as opposed to the blues favored by her cold-hearted mistress Morlanna. 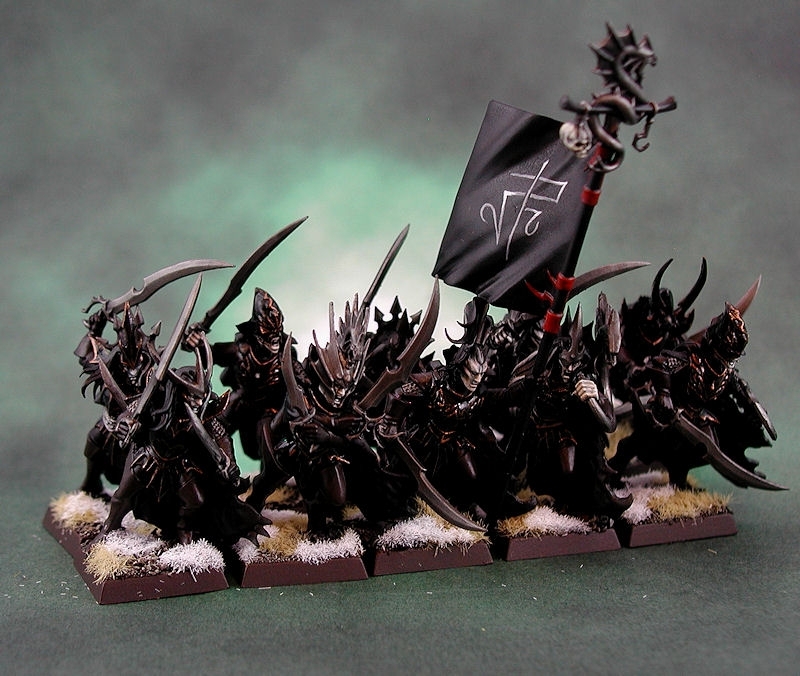 I gave these guys cloak from Wood Elf glade rider models, as almost the entire army has cloaks to protect against the winter cold. 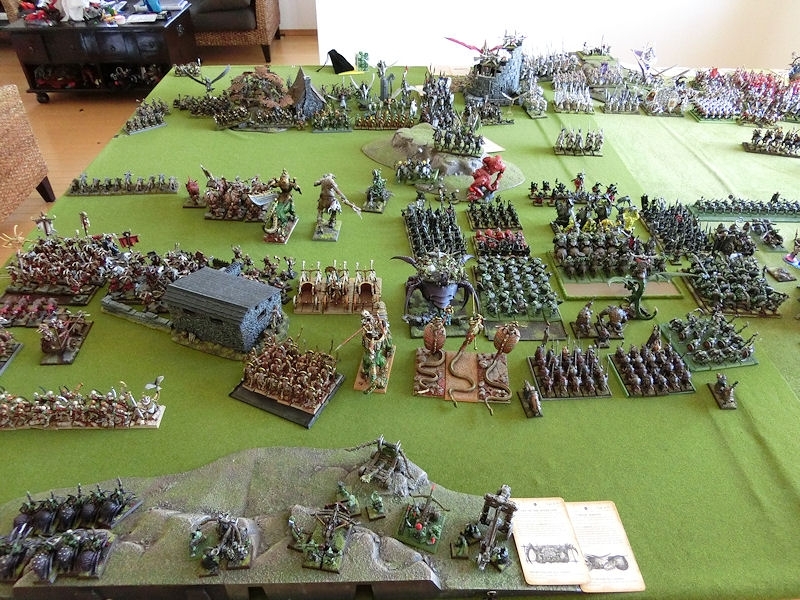 I also made plenty of head swaps between all the elf ranges, giving this army a wilder, more varied appearance. The cold one colour scheme was a simple black wash on top of mechrite red, and then a careful drybrush with blood red. 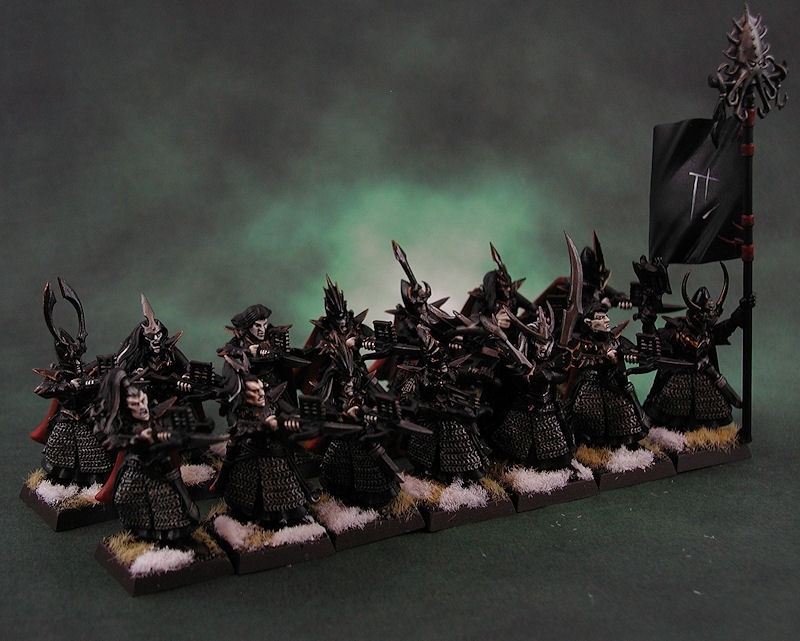 There are twenty corsairs in this unit, which are horrible to rank up properly! These guys have less armour to the front, so there's a fair bit of scorched brown leather on the models. The metallics were an easy boltgun metal basecoat with heavy black wash on top. 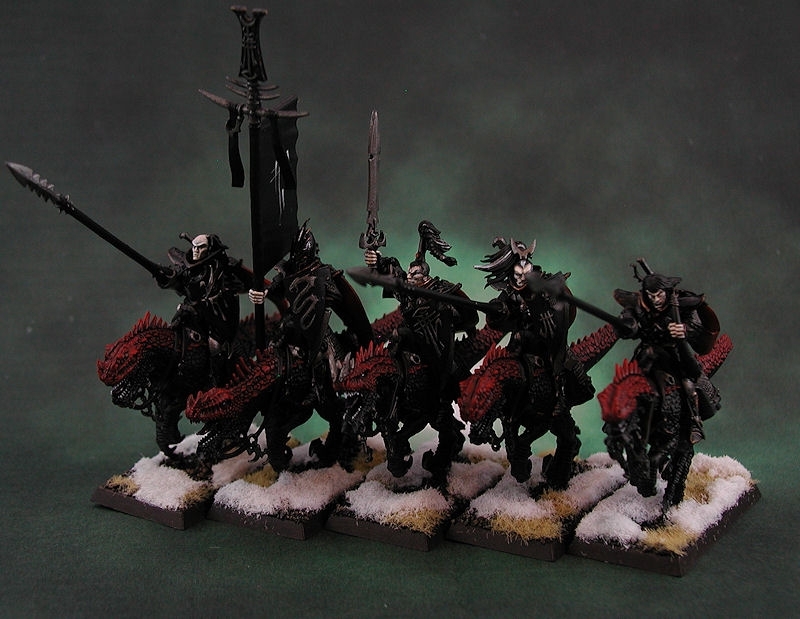 The corsair unit actually looks much cooler from the back, as they have sea dragon cloaks to match the black and red of the cold ones. I want one! A very boring unit of crossbowmen. 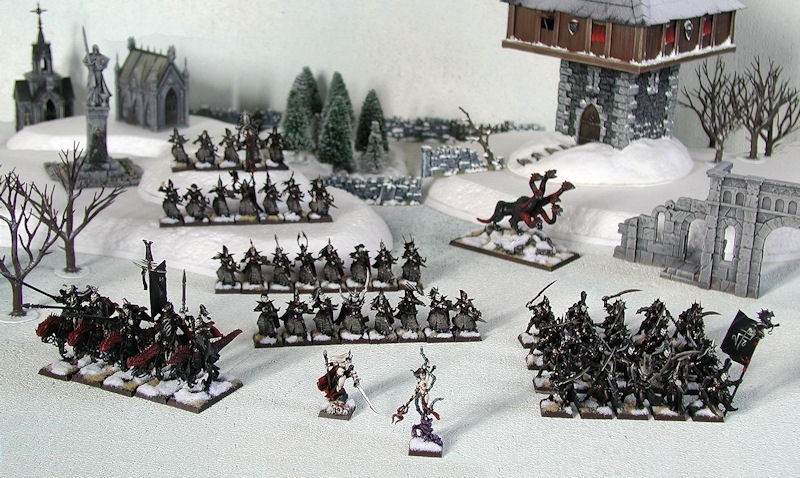 There are 28 in all, of which half have winter cloaks stolen from high elf models. Only the inside of the cloaks are red, while the outsides are a more fitting deep black. You can see how pale the faces and hands look on this unit, and how difficult the army would be to spot at night! 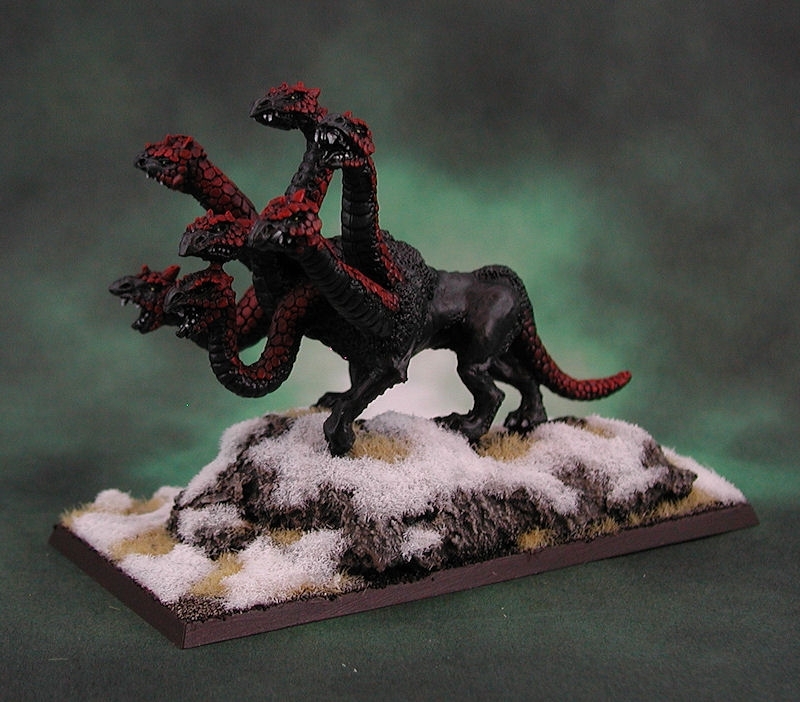 Finally, we have an old Marauder model of a metal hydra. 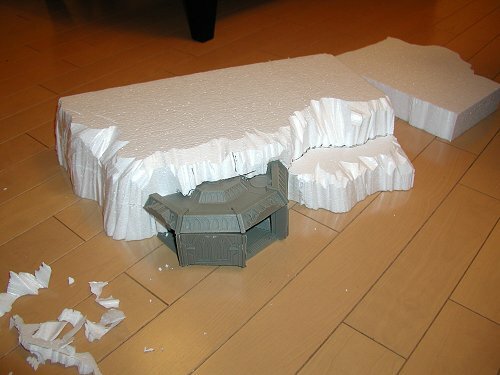 While the model is considerably smaller than the newer plastic version by GW, I used a broken piece of concrete and a large base to make it seem bigger. The paint scheme is a bit boring, I know, but it probably won't see much tabletop action anyway. It's just there for 'cool' value. I received these very evil-looking Avatars of War harpies for Christmas. High quality resin multipart casts, and I decided to base them at varying heights so that they might rank up on the tabletop properly. A couple of models (far left and centre harpies) were so high above the ground that I had to add heavy metal elements to the bases to aid balance - hence the goblin behind the banner. Each model was pinned very carefully with brass rod through their feet or ankles, to keep contact with their base to a minimum and give the impression that they really were swooping around. Not a very thrilling paint scheme, but I always find that horror movies are much scarier if you can't clearly see the creature hunting you - think of the original Alien movie. So I went for a simple black and dark red combination. I grabbed 20 of these superb metal Witch Elf models from Raging Heroes as soon as I saw them on sale, but it took me a while to work up the courage to paint them! So much bare skin!! I stuck with the army-wide colour scheme of black armour, carefully edged in bronze. The red accent colour was this time used in the hair as stripes of dark red, and in the banner - which rather looks like it has been dipped in blood. The sculpts are absolutely stunning and feminine, so I took extra care to get the faces looking good by gently shading above the eyes with just a hint of red, and again for lipstick. These 5 form the front rank of the unit, and were given an extra dose of blood splatter. My recipe for this was mixing red ink and black ink to get the right shade of arterial splatter, and then carefully flicking it off a thin stiff brush at the front of each model. The leader (light grey hair to mark her out) is positively drenched in the stuff. Once the models were clear varnished, I went back and carefully covered all of the blood with gloss varnish to make it look fresh. 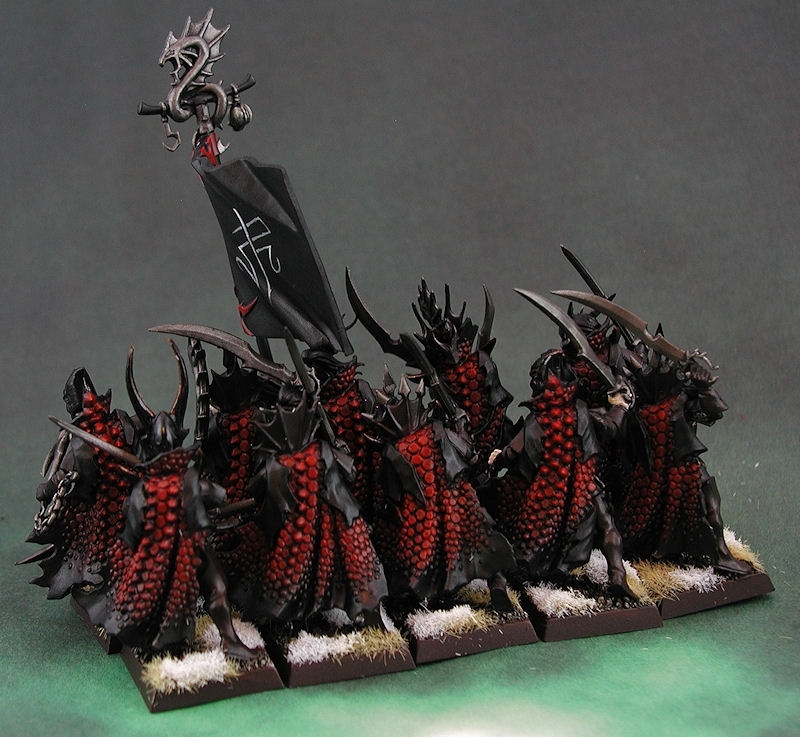 And here's the entire unit of 20 witch elves. Although the models come in a variety (10?) of acrobatic poses, they actually rank up fairly neatly - a nice surprise! In games, these are terrifying if they make it to combat - I've seen them cut down a charging stegadon in one turn, before it even got to attack!! 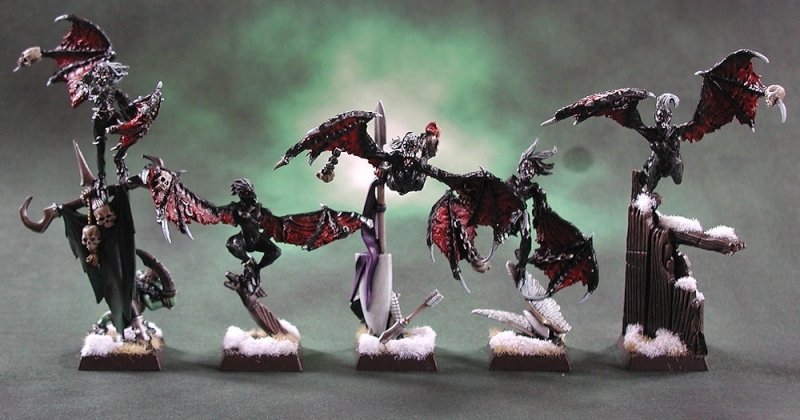 I strongly recommend these models as far superior to GW's efforts.... these are truly how dark elf witches are supposed to look! Who doesn't love dragons, eh? 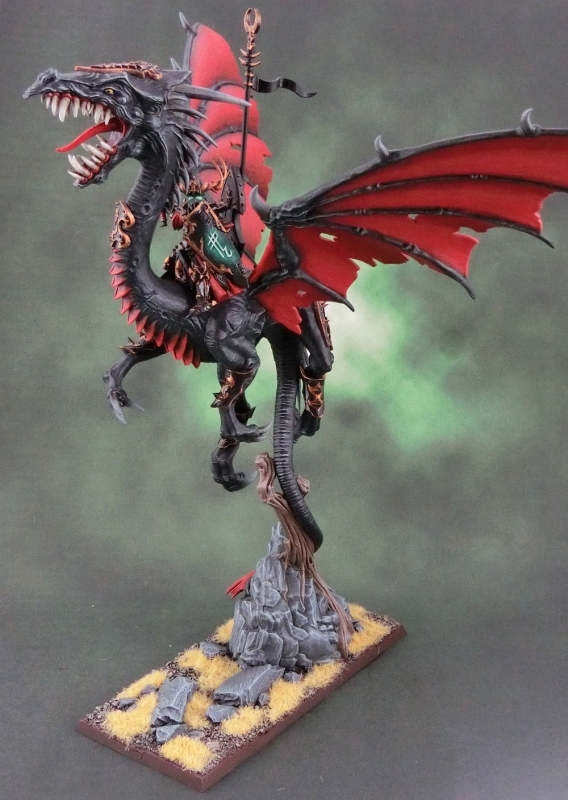 When I feel like I've lost my painting mojo, I find a dragon always cheers me up, so here's a Dreadlord on Black Dragon. 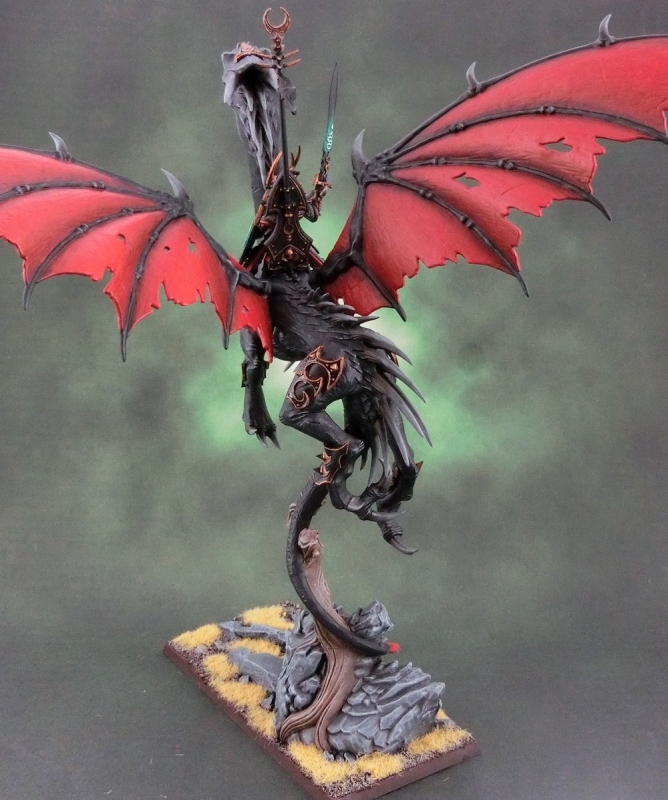 The twisted, dark feel to this dragon is a perfect couterpoint to the nobility and grace of the high elf dragon, and I decided to model this one as the Witch King himself. Thankfully most of the parts needed, including the distinctive twisted helmet horns, come with the set. I simply gave him a head swap and greenstuffed the helmet closed - leaving only the eyes exposed. I kept to the army-wide colour scheme of red and black for the dragon, but gave the Witch King a few colour highlights - glowing green eyes worked well with glowing runes on his shield and sword. It's just a shame that the rider model is largely obscured behind the dragon's neck! Those photos turned out nice - the background really suits. 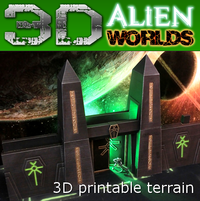 Yeah, would anyone find it useful if I put those backgrounds (I think there are 5 in all) onto PDF files and stuck them up for people? Wow! They are amazing. Great job there. Love the bloodfrenzy there got going. Thank you, Vlad and Jonas - the encouragement is really appreciated!